Kingsley Ben-Adir stars in DEEP STATE as “Khalid Walker,” British, 30’s and The Section’s second-in-command. Walker is plain-talking, no nonsense, often grumpy and always cynical. White’s ‘junior partner’. Walker hates being kept in the dark but doesn’t possess the political nuance to outmaneuver White. 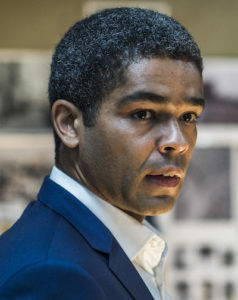 British actor Kingsley Ben-Adir is best known for his portrayal of Dr. Marcus Summer in ITV’s hit mystery drama Vera. Other TV credits include Death in Paradise, Ordinary Lies, Agatha Christie’s Marple and Midsomer Murders. He appeared in Guy Ritchie’s King Arthur: Legend of the Sword, alongside Charlie Hunnam, Jude Law and Annabelle Wallis, and BBC’s TV film Diana & I along with Tamsin Greig and Nico Mirallegro. He’s appeared in the crime drama Trespass Against Us opposite Michael Fassbender and Brendan Gleeson and the 2018 action-thriller The Commuter, alongside Liam Neeson. Kingsley is highly prominent in the realm of theatre, having played multiple characters in the award-winning play The Riots at the Tricycle Theatre, which focused on the real lives of those who were involved in the London riots of 2011. Kingsley also featured at the Royal Court in The Westbridge, as well as A Midsummer Night’s Dream at the Regent’s Park Open Air Theatre and Much Ado About Nothing at the Old Vic.